Water is essential for life. It shapes where and how we live, determines the availability of food and other services that underpin human well-being and is crucial for healthy natural ecosystems. Yet in Australia and globally the water cycle has been significantly influenced by climate change, leading to more extreme droughts and floods. Our latest report, “Deluge & Drought: Water Security in a Changing Climate”, has found the severe drought gripping much of Australia has been exacerbated by climate change. Australia’s water security has already been significantly influenced by climate change. Rainfall patterns are shifting and the severity of floods and droughts has increased. Droughts are becoming more severe due to drier, hotter conditions, leading to declines in soil moisture due to increased water loss from plants and soils. Southeast Australia has experienced a 15% decline in late autumn and early winter rainfall, and a 25% decline in average rainfall in April and May over the past two to three decades. This area includes major population centres of Brisbane, Sydney, Canberra, Melbourne and Adelaide. Hotter conditions and reduced rainfall have led to less runoff into streams, rivers, lakes and dams in the southwest and southeast of the continent. In southwest Western Australia, reductions in rainfall, due to climate change, have led to a more than 50 percent decline in streamflow. Across the Murray-Darling Basin, streamflows have declined by 41 percent since the mid-1990s. A warmer atmosphere can hold more water vapour, contributing to an increase in heavy rainfall events and an increased risk of flash flooding. Warragamba Dam in NSW is currently at 64.9%. The severe drought being experienced across Queensland, NSW and northern Victoria is being influenced by climate change. The severity of the current drought is being increased by the long-term declines in rainfall and the hotter conditions associated with climate change. Since the mid-20th century, the severity of droughts, such as the Millennium Drought, has also been increased by climate change. On-going failure to reduce greenhouse gas emissions from coal, oil and gas, globally and here in Australia, has already negatively affected Australia’s water security and will increasingly affect it into the future. Profound changes to Australia’s water cycle are projected, with increasing threats to our urban water supplies, the agriculture sector and natural ecosystems. Severe droughts are expected to become more frequent, especially across southern Australia, while extreme rainfall events are expected to become more intense everywhere except, perhaps, for the southwest corner of Western Australia. Across southern Australia, cool season rainfall is projected to continue decreasing and time spent in drought is projected to increase. Less water is likely to be available for agriculture, urban water supplies and ecosystems in coming decades across southern Australia including regions surrounding Melbourne, Adelaide and Perth. A 2°C rise in average global temperatures could lead to an 11–30 percent increase in extreme rain events (wettest day of the year and wettest day in 20 years) across Australia. The severe drought gripping much of Australia has been exacerbated by climate change. Significant impacts on and risks to our water security are already evident, and these risks will continue to escalate unless deep and rapid reductions in global greenhouse gas pollution can be achieved. Health: Severe droughts, heavy rainfall and floods all affect our health in many ways – contaminating water supplies, increasing mosquito-borne diseases such as Dengue and Ross River virus, and increasing psychological stress in rural communities. Agriculture: Drought has a significant impact on agricultural industries and communities. Severe droughts kill livestock, destroy crops and increase soil erosion, leading to higher food prices and loss of livelihoods. Water supplies: Less water is likely to flow into dams in southern Australia as a result of human-driven climate change. Water infrastructure: Water related infrastructure, such as water supply reservoirs, dam spillways and river levees, have been designed for historic rainfall patterns. Upgrading this infrastructure to cope with increased flooding and drought, as well as building new infrastructure like desalination plants, is expensive. Over $10 billion has been spent recently on desalination plants to improve water security in our major cities. Energy: Coal, gas and hydro power stations require significant amounts of water and can be negatively affected by drought. Bushfires: Severe drought leads to higher bushfire risk as shown by the current bushfire season across the southeast of Australia. Changes in land cover due to fire can adversely affect catchment water supplies. 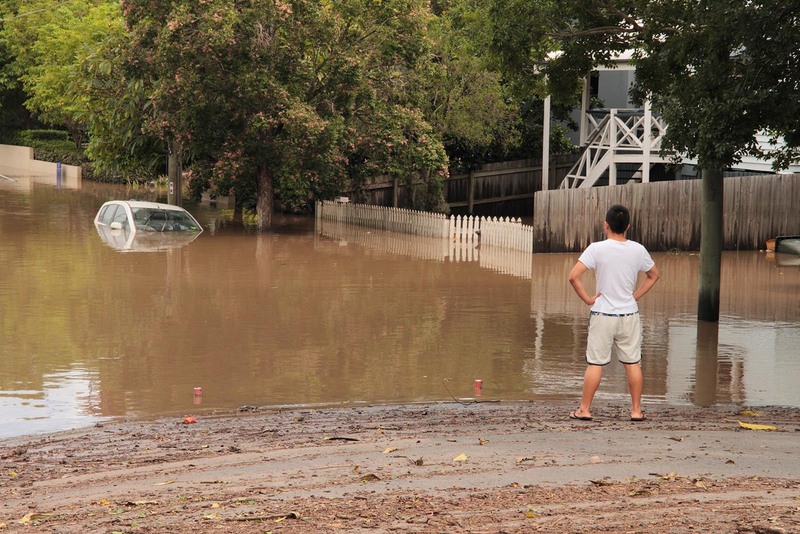 Flooding: The economic consequences of floods and droughts are significant; the extensive Queensland floods of 2010-2011, for example, cost to the state more than $6 billion (directly). Plants, animals and ecosystems: Declining rainfall in southwest Western Australia has affected freshwater fish species. The Murray-Darling Basin has been under considerable pressure, further reductions in rainfall and runoff will make it even harder to rehabilitate degraded aquatic ecosystems, affecting bird and fish life. In 2016 warmer and drier conditions in Tasmania triggered bushfires that severely damaged over 70,000 hectares of western Tasmania’s World Heritage-listed forests and alpine areas. Increasing global water insecurity is becoming a ‘threat multiplier’, with significant implications for Australia and other regions. The worst drought in Syria’s history, likely influenced by climate change, was a factor in triggering conflict and instability in that region, leading to a surge of refugees into Europe. Agricultural systems on the Indian sub-continent are vulnerable to the melting of Himalayan glaciers and instability in the Indian monsoon system, with implications for political and social stability in our region. The global food trade system is vulnerable to prolonged and severe droughts in major food-producing regions, such as the central United States and southeast Australia. Australia’s water security is dependent on action on climate change, particularly on the rapid phase-out of fossil fuels. Australia’s water security is threatened by climate change. Coping with increased frequency and severity of drought and floods is costly and will become progressively more challenging into the future. Continuing on our current trajectory of high emissions has enormous and growing risks. Short-term drought solutions will ultimately be futile without concerted and rapid action to tackle climate change, both here in Australia and globally.